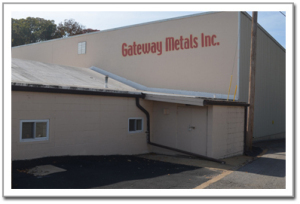 About Us | Gateway Metals, Inc.
Gateway Metals is an independently owned and operated full service processing distributor of Tool Steels and Specialty Metals located in St. Louis, Missouri. Gateway’s employees have well over 200 years of combined industry experience. Continuously focusing on providing our customers the highest quality material and service at a competitive price, allowing them to produce their tool or build their machine at the LOWEST POSSIBLE COST. A complete line of Tool Steel inventory in excess of 2,000,000 pounds stocked in our 50,000 square foot St. Louis warehouse. Custom plate saw cutting up to 30 inch thick. Custom block saw cutting up to 52 inch square. Precision carbide saw cutting as close as .020. Bar edge milling to within .010. Custom hollow boring round stock. Custom precision milling and Blanchard grinding to tolerances as close as .005 with flatness, squareness and parallelism within .002; repeatability of dimension within .002. Custom surface grinding to +/- .001. Consistent, square, accurate cuts including CARBIDE EDGES on bar stock cut from plate to the closest tolerances in the industry. Non-standard bar sizes readily available at no extra cost. Extended working hours provide consistent, on-time deliveries. Fast, accurate order placement and handling. A CENTRAL LOCATION for steel reduces confusion on paperwork allowing all orders to ship from one location complete and on-time. Metallurgical assistance available along with qualified team players that care and follow through.